Fireplace, dishwasher, microwave, washing machine, hair dryer, telephone, wireless internet access, computer available, cable/satellite television, DVD, music center, pool (12m x 6m), table tennis, toys for children. Heating extra, tourist tax to be paid locally. The house viewed from the pool. The pool with its loggia and surrounding views. Another view of the very large sitting room. The courtyard with seating and table for meals al fresco. Another sitting room in the house. Another bedroom with large bed. One of the bathrooms with shower stall and two sinks. One of the bathrooms with bathtub. The estate is surrounded by vineyards. This beautiful property belongs to the Campalli estate, a huge farm of 750 acres that produces Chianti Classico wine, and includes the Castle of Campalli. The 360° view from each point on the estate ranges over endless rolling hills, vineyards and olive groves. On a clear day it is possible to see even the towers of San Gimignano in the distance. 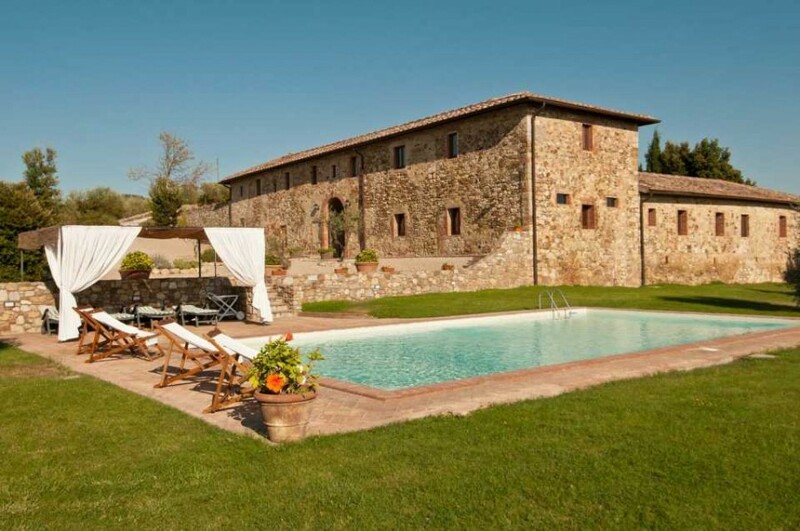 La Corte di Campalli is an impressive stone-built farmhouse that dates back to the 16th century. It takes its name from the striking internal courtyard around which it was built. The property was totally restored in 2002 by its discerning owners, who used authentic traditional materials of the area and equipped it with all modern facilities. The interiors are particularly airy and spacious, with doors both to the courtyard and to the garden. Guided tours of the estate and the castle, including Tuscan wine tasting, can also be arranged. Past clients particularly appreciated the visit of the wine cellars guided by the owners, and the experience is even more enjoyable in September, a beautiful month for visiting this part of Tuscany, when the guests can assist and participate to the wine harvest. Although in a secluded and quiet location, it is only 7 km away from a highway exit and therefore is also an ideal base for trips to the Chianti area and main Tuscan towns. Guests will enter through a big arcade on the ground floor. There they will find a huge sitting room with arches opening both to the courtyard and the garden, a large kitchen/dining room, a TV room (with satellite TV), one twin bedroom and a bathroom with shower only. There is also a room with bread oven and a laundry room on the ground floor. Upstairs there are two master bedrooms with en-suite bathroom (shower only), two twin bedrooms, a bathroom and a sitting room with fireplace and piano opening to a patio with table tennis. In a separate wing, there is another master bedroom with sitting area and en-suite bathroom (shower only), accessible from the ground floor by an independent staircase. 6km to Badesse food shops, 9km to Castellina in Chianti bank and PO, 18km to Siena center, 7km to nearest highway exit, 62km to Florence. "The pictures...did not do the place justice. The villa was great in every way...A great trip!" "I found the property to be considerably more beautiful than I expected. The house is large and beautifully situated in vineyards. The view in every direction is magnificent. The house was immaculately clean. The rooms are large and nicely furnished. It was a great place for little kids with the enclosed courtyard too."